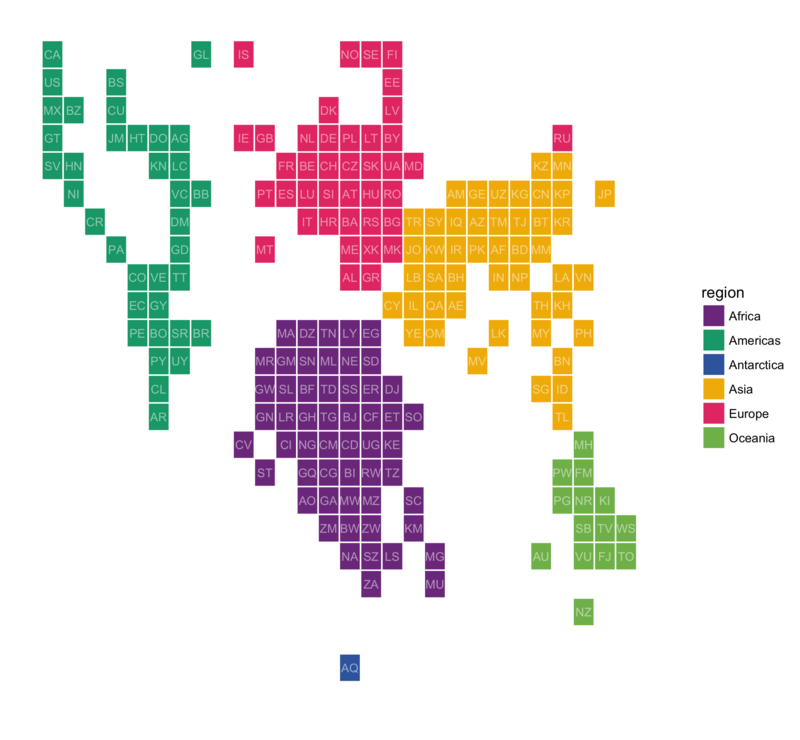 What if you want to make a map (of the EU, or of the whole world for example), but you want all countries to be clearly visible, including the very tiny ones? 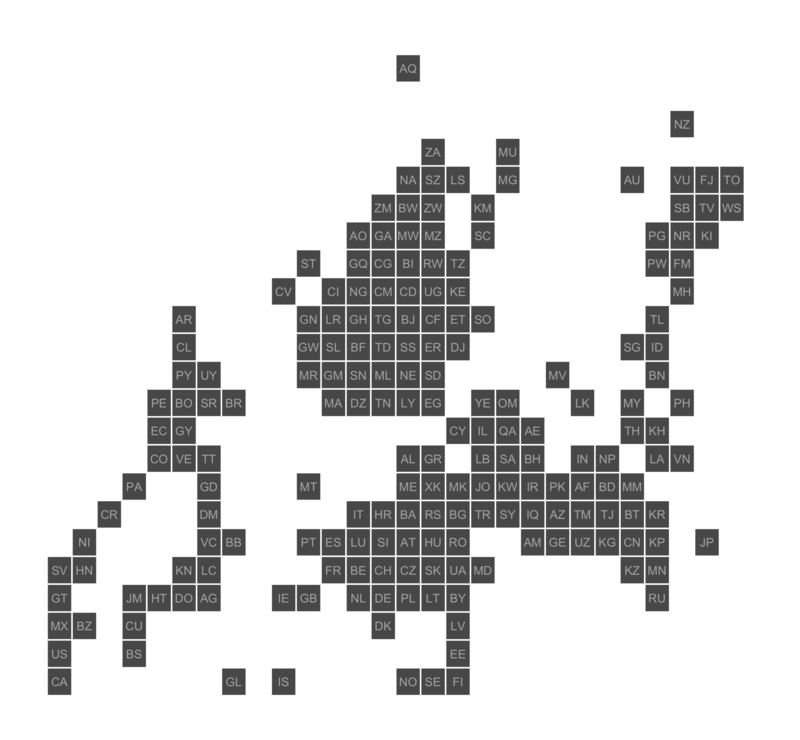 That was what I needed for the Eurosearch Song Contest and so I made a square tile grid map of Europe. 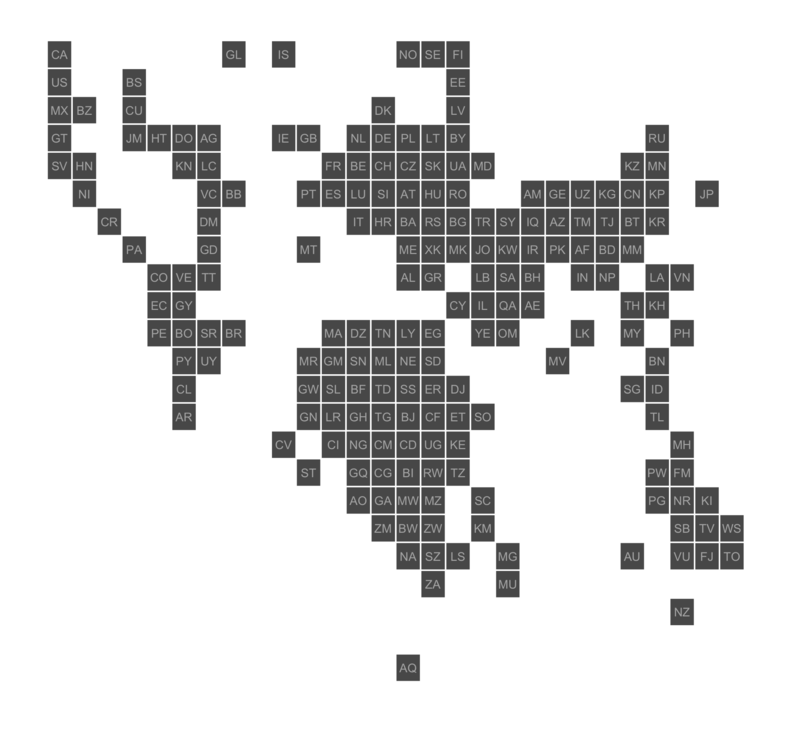 Using a tile grid obviously comes at a cost: geography is not respected. Big countries become smaller, small countries become bigger, countries are shifted away from their geographically correct position, neighboring countries are separated and non-neighboring countries can end up next to each other. 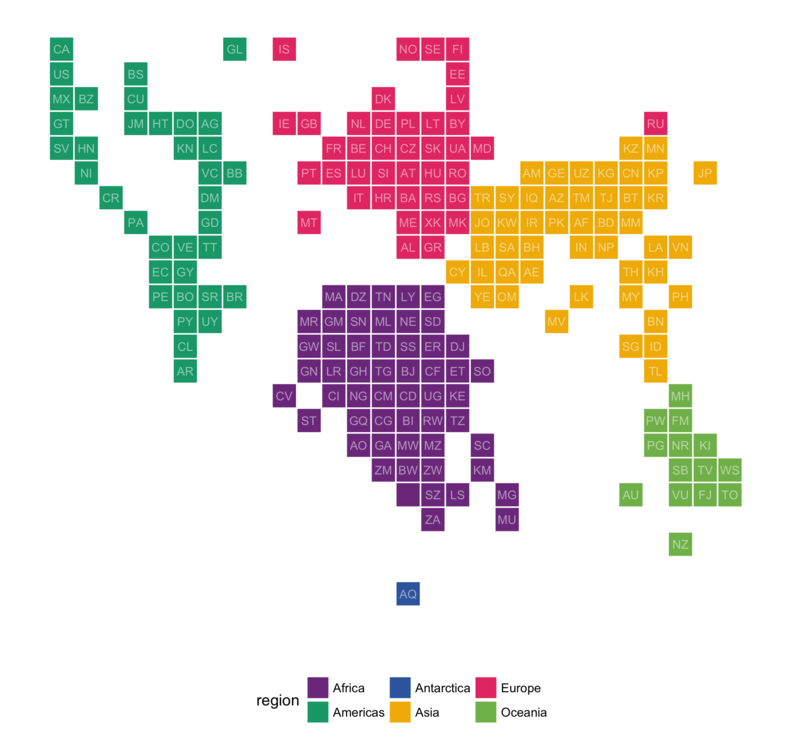 But still, tile grids can help you show all countries, including the small ones, with an indication of their geographical location. 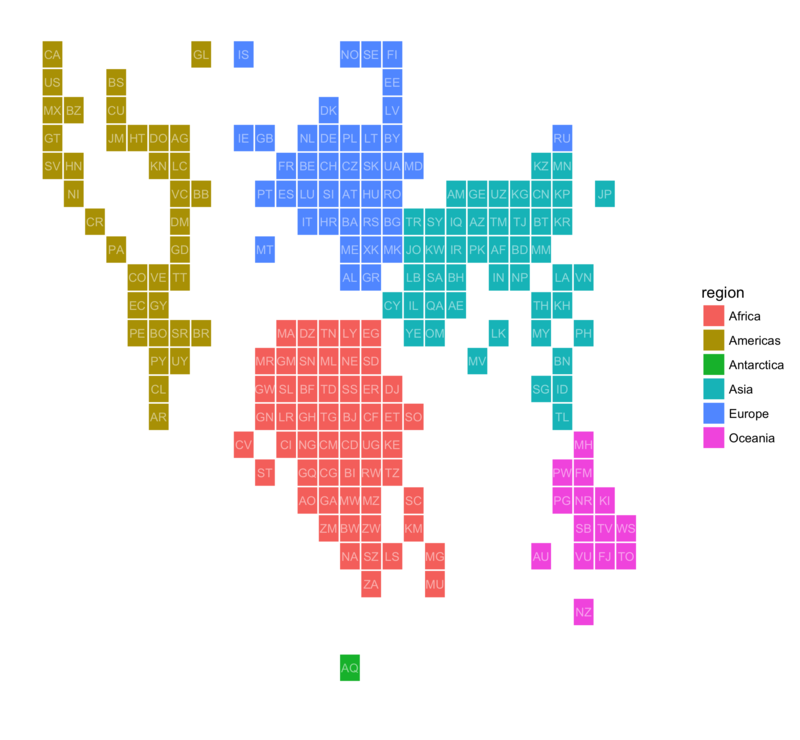 If your main message isn’t the geography, I think these grids can be quite useful. 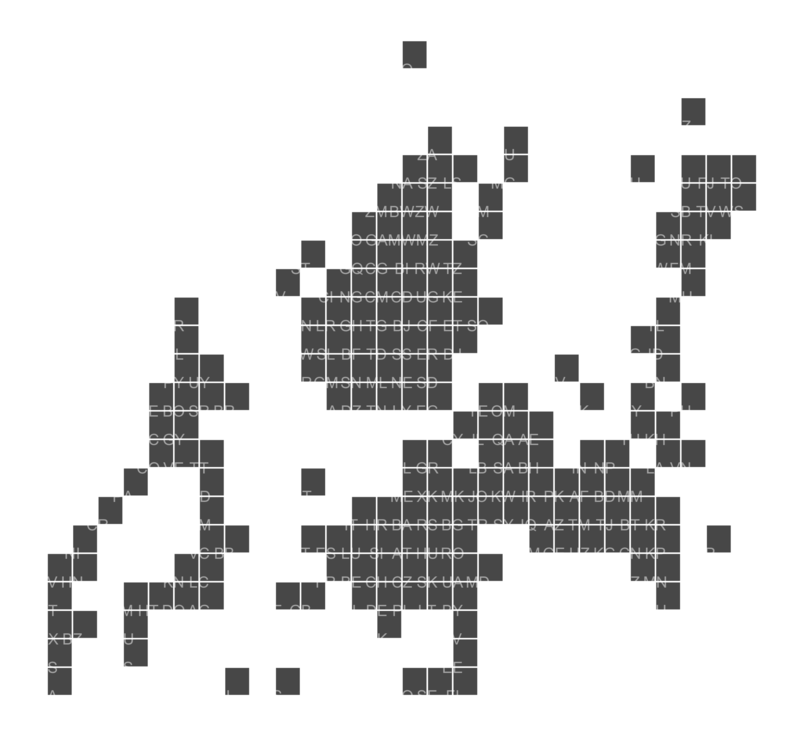 My Europe tile grid led to Jon Schwabish making a version for the whole world. A great effort, and because I had an idea for which this world map could work well, I decided to port Jon’s map from Excel to R for some experimentation. 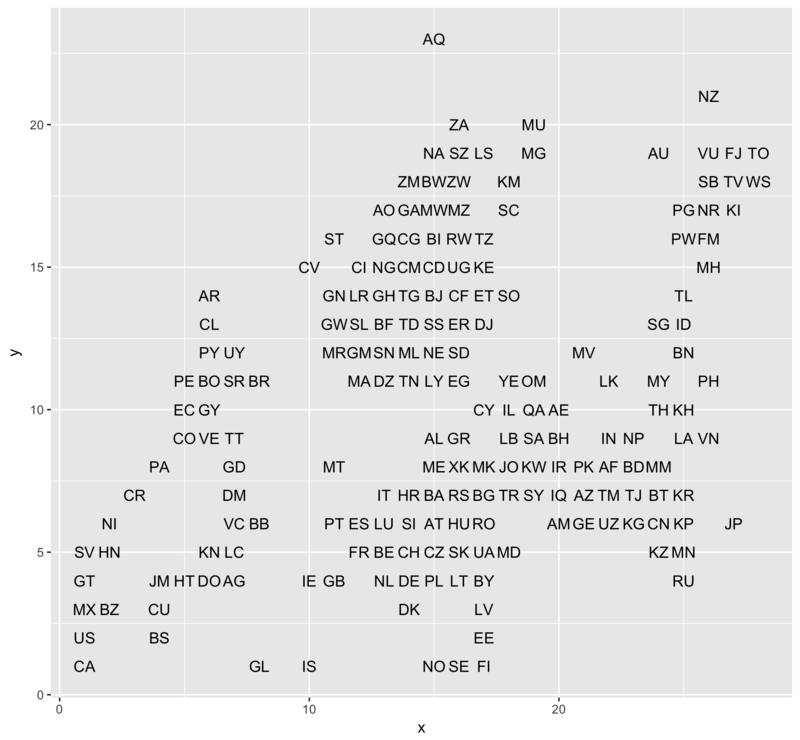 So in what follows, I explain how I remade Jon’s map with R and the ggplot2 package. Starting point was the json file Mustafa Saifee derived from Jon’s data. I converted it to a csv file as the starting point for this tutorial. 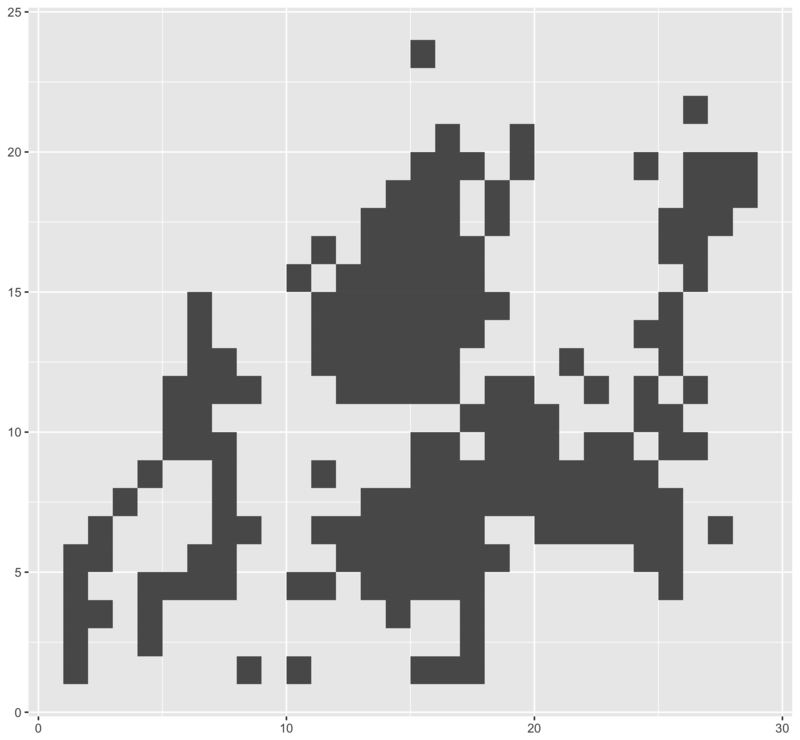 This tutorial is not meant to be an introduction to ggplot2, but what we’re doing here is using the x and y grid coordinates of the data to plot the country codes of all the countries. Nice. But by now, you’ve noticed of course that the map is upside down. Jon’s initial map was made in Excel, which starts counting rows from the top. From the axes in the first 2 plots in this tutorial, you can see that we’re plotting with a y axis running from bottom to top. So we need to switch that. Now let’s add some color. Notice the added ‘fill = region’ in the plot aestethics. 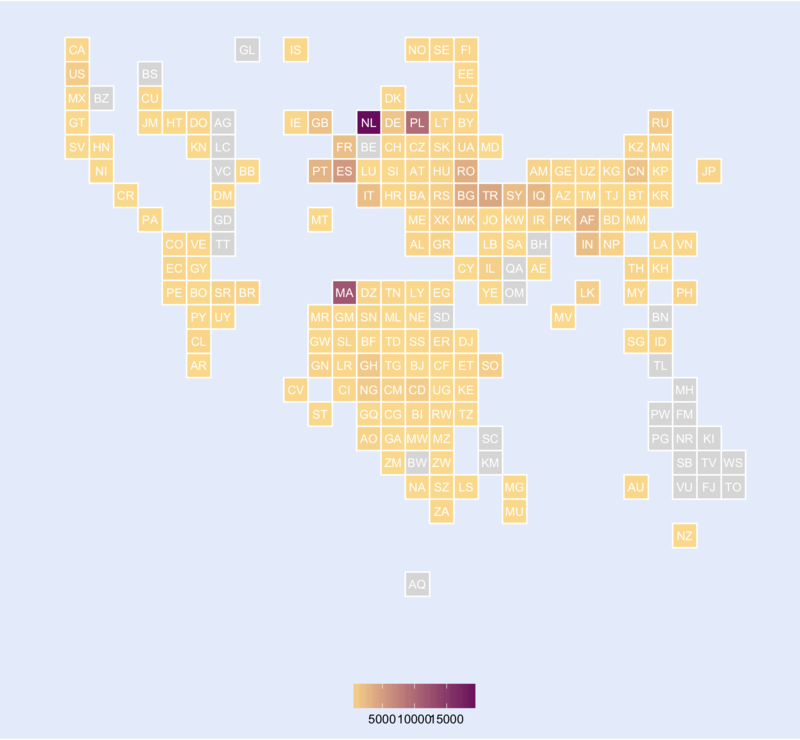 Country tiles are colored by region and ggplot adds a legend to the plot. Let’s move away from the default ggplot2 color palette and use some CartoColors. Good. But sharp-eyed readers will have noticed that adding the legend skewed the tiles to become rectangles instead of squares. 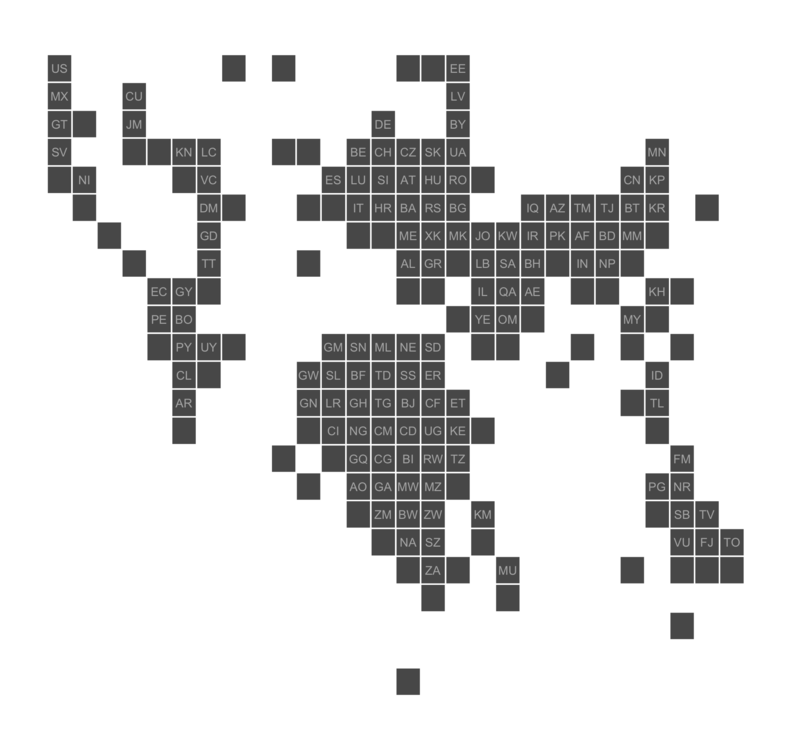 Let’s move the legend to the bottom and make sure to always have square tiles with ‘coord_equal()’. I’ve got some more plans with this data set, so stay tuned!